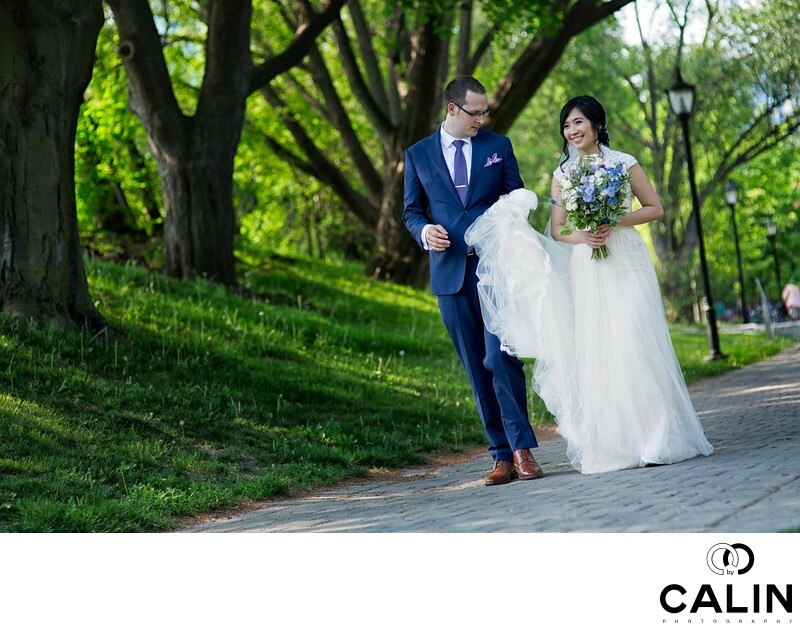 When I booked this wedding at Hart House, in the middle of Toronto, I was fully aware of the beauty of University of Toronto and its surroundings. The bride and groom were both graduates from the University of Toronto so they wanted to get married at Hart House. After the ceremony inside the courtyard, we headed for an the photo shoot. After we photographed close to the U of T buildings built in the Gothic revival style, I suggested that we should along the Philosophers Walk. Of course agreed! After all, the Philosophers Walk is one of the secluded area has in downtown Toronto that makes you think you are in a deep forest. That is, because I used a long lens. This picture scratch that this image pictures the bride and groom walking happily next each other. The groom is holding her dress and she is holding a bouquet. He is looking at her and she's smiling. This is a completely candid photograph although, truth be told, I asked them to walk on the pathway. To increase the dynamism of this image I employed a Dutch tilt technique where I rotated the camera by about 15°. That makes the bride and groom stand along the reciprocal line that intersects the baroque diagonal in the frame. The emotion in this image and its composition makes it stand out. Location: 7 Hart House Cir, Toronto, ON M5S 3H3.